Milan’s first ever Report of Sustainability was released earlier this week by Adriano Galliani and Barbara Berlusconi – their signatures are also found on the opening letter in the document – and generally flew under the radar of the mainstream reporting, despite containing several interesting pieces of information and some great stats. What follows is a translation of the important parts of the document – primarily those related to the finance and business side of the club – coupled with some comment or analysis where applicable. Let’s first start with the reason for the publication of this report. It is intended to give ‘stakeholders’ in the club an overview of the business direction the company (Gruppo Milan) are taking, for which the clue is in the title – sustainability. The club want a business model that is sustainable and self-sufficient, not one that loses money each year or needs propping up by Fininvest, who are the controlling company of Gruppo Milan. The start of a serious process of rethinking with respect to its mission and, consequently, to its business model. Milan, conscious of the values that are represented on a global level, have embarked on a path of social responsibility. Following this direction, we have decided to make available the accounting practices and the principles of social responsibility that guide our business and mode of entertainment. Below are the interesting parts from those sections. Although not massively pertinent to Milan’s financial issues, the mission statements are a good opening gambit. The rest of this section talks about organisational structures, how the different parts of Gruppo Milan interlink, code of ethics – not stuff that is worth reporting here. The most important point here is that the words of Adriano Galliani on reducing the numbers in the first-team squad – words which we have heard a number of times during this pre-season – are now in writing and are a clear part of the financial plan going forward. In the 2012-13 season the average number of players in the squad was 32. The commitment of all the players that wear the Milan shirt is that of maintaining a high level of competitiveness of the squad so that they are always able to aim for the maximum results through discipline, the dedication to work and sacrifice. Economic-financial and sustainability calculations aim to bring the number of players in the squad to a maximum of 25, with a cost equal to 50% of revenue. The goal of 25 is fairly standard – Jose Mourinho often talked of a squad size around this figure during his tenure at Inter – and it is about time that Milan made a commitment to get the squad size under control, because it has been too big for the last 3-4 years now. Part of that is down the horrendous injury situation the team has faced in each of the last five seasons, which forced the club to buy more players in January windows to cover the gaps left by the absentees. For 2012-13 they tried to wrestle the balance back in their favour. Daniele Tognaccini – who for so long was the head fitness coach (or ‘athletic trainer’ as they call them in Italy) – was moved into MilanLab in an analytical role. Simone Folletti took over as head fitness coach, and give him his due, the injuries were down on previous seasons, but this needs to be maintained long-term over several campaigns. The last point in that quote hasn’t been spoken of a great deal in the public domain by Galliani or Barbara Berlusconi – the desire to see the squad costs (I.E. wages) equate to no more than 50% of turnover is a figure that the majority of football clubs are aiming for. Barcelona, for example, want the ratio down to 55%, which they achieved in their latest financial statements published on Friday 20 July. The latest Milan accounts for the year 2012 matched Barça’s figures in this aspect, showing salaries accounted for 55% of turnover – a great result on the face of it and pretty close to the ratio the club are seeking. The issue is that last year’s accounts featured a large amount of income from player sales, which skewed the turnover slightly. That does a slight disservice to the efforts put in to reducing the wage bill – just under €23m was slashed from 2011 to 2012 – but the fact is that had Milan not sold Zlatan Ibrahimovic or Thiago Silva, the squad costs would have been nearer 65-70% of revenue. Next year is likely to feature a similar story. The huge level of income from the 2012-13 Champions League campaign could well skew turnover to ‘unnatural’ levels again. This is mostly common sense, but worth highlighting their recognition of the fact nonetheless. Scouting is a fundamental activity for the youth sector, above all for the lower age groups. Through the work of the scouts players are recruited starting from the squad of the Pulcini (under-9s). A good selection in this age group avoids excessive interventions in the higher age groups that could drive the club to major investments in economic terms. Milan’s commitment to youth development is also driven through their football schools and Milan junior camps. 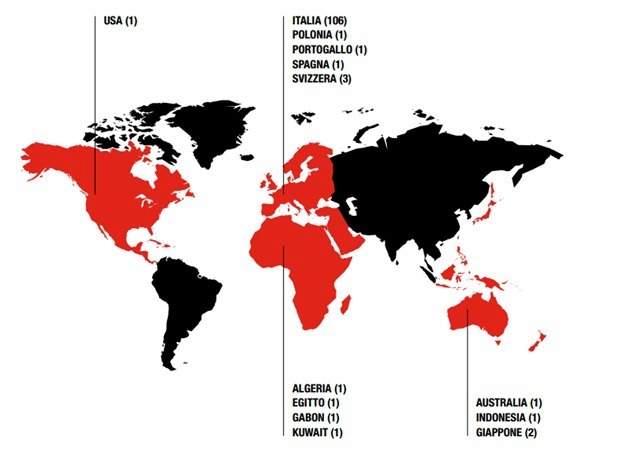 Milan have 121 football schools – 106 in Italy, three in Switzerland, two in Japan, and one each in the US, Egypt, Algeria, Gabon, Kuwait, Spain, Portugal, Poland, Australia and Indonesia – with around 25,000 kids enrolled altogether. The Milan junior camps are a bit like the UK version of summer football camps. Children have the opportunity to play football, get some official kit and have fun. This section contains mostly numbers on staff, ‘leadership’, and lots of management speak. Milan apparently have 317 million fans worldwide. 41.7 million are in Europe, with 7 million in Italy. No details are given on how they came up with these figures. A few points here on the club’s relationship with the supporters, how they want to encourage them to come to the stadium etc. Note the reference to the competition from TV. They’re referring to the fact that every game is screened live, meaning that fans have no need to come to the stadium if they want to watch matches. This factor is often overlooked when it comes to talking about Italy’s stadium attendances – most discussions spout the usual ‘stadia are old, unsafe, need renovating’ lines with no real thought behind other factors such as TV, which surveys have shown do play a part in fans’ decisions not to travel to the stadia. Quite frankly, it is about time they did this. Cuore Rossonero came into being in 2008, but only five years later will it be available to fans abroad. The reason they have been unable to offer it outside of Italy is because the card had to be acquired through a bank – not Milan’s official website – which meant it automatically (whether you wanted it to or not) doubled up as a debit/credit card. For that you need an Italian residence, resulting in foreign fans missing out. As it stands, the only way to obtain a Cuore Rossonero is to buy a season ticket through Milan Point – an official seller of Milan tickets to fans abroad – who are somehow able to provide non-bank versions of the card. Right now there are no details on when during the 2013-14 season the club will allow foreign fans to obtain a Cuore Rossonero, or indeed how they can go about getting one. One final point – the club are introducing the ability to pay for a season ticket in monthly payments for 2013-14. This will probably only be available to Italian-based supporters, but nonetheless is a demonstration of their desire to encourage fans to become season ticket holders. Number of Cuore Rossonero card holders as of the end of 2012-13. Milan sold to Adidas the rights of the Master License starting from the 2008-09 season until 2016-17. It deals with 70 licenses, not including other rights that remain with the club – publishing, multimedia, videogames, mobile, internet, credit cards, loyalty programmes, financial services, insurance, names and numbers on official shirts, and franchising. Potential partners are selected and proposed by Adidas to Gruppo Milan for approval, according to the criteria of high standards of quality, of professional image, of standard rules and of conflict with merchandise categories already covered by Gruppo Milan. The Master License cost Adidas €700,000 last season and, as stated above, gives them a little commercial freedom. A franchising contract cost any business that wanted to become a franchisee €450,000 last season, while licensing was worth €500,000. Franchising opportunities included becoming an official retailer, official e-commerce store, official corner or an official restaurant café. Merchandising is a tricky area to break in Italy and is hugely different from somewhere like England. Anyone who has attended a live match in England will know the scene – thousands of fans kitted out in the team’s shirt. It is a cultural part of the match experience in the country. Italy is different, and the fans that attend games don’t have the same desire to demonstrate some sort of tribal allegiance by wearing the same colours as everyone else. Most attend in their own clothes – the only show of team colour being the presence of a scarf. Generally speaking, most of the fans that wear Milan shirts in San Siro will be children or overseas supporters who think the culture in Italy is the same as everywhere else. Galliani recently bemoaned the lack of fans wearing Milan shirts at San Siro only a few months ago – he was probably speaking with his marketing head on. Financially it can profit the club if they sell enough, but they have to find a way of getting the tifosi on board with buying shirts. This section mainly talks about social media, Milan Channel, the Milan Foundation and the reach they have with of these communication mediums. This covers San Siro, Milanello and Vismara. There is nothing new on San Siro – it makes a passing mention of the redevelopment of the stadium to host the Champions League final in 2016, but you can read more about that here in a translated interview with Pierfrancesco Barletta, from M-I Stadio. This report does not go into the details. There’s a breakdown of the number of seats in each stand (San Siro’s capacity is 79,471) and how much energy is used over the year. The info on Vismara and Milanello is much the same, albeit with a breakdown of the number of pitches and the type of grass on those pitches. It finishes with an explanation of why they are moving into a new headquarters, away from Via Turati. The decision to locate a new headquarters that represents the main activities of Gruppo Milan was the response and the valid element of the strategic decision taken by the company – a new model of sustainable business that searches for the maximisation of revenues through the extension of the brand (in products, services and markets) to support sporting excellence. The choice of a different location of offices for the Group was also motivated by reasons of environmental sustainability. The technical characteristics, architectural and structural make up a building installation with class A energy classification. And that is about it. Appendices follow this final part, with nothing warranting a comment or translation. Any questions or comments, feel free to ask below. Hey David, am a Milan fan from Uganda East Africa and i really appreciate the work you are doing. Thanks for the kind words, Jesse. I dream that some day, Milan would open a summer camp in Mexico and South America. So much potential there that is wasted due to bad managment and corruption of the local leagues. I think that a foreign team such as Milan could make profit (in terms of calciatori) of these places, where you eat, speak and breath football. Great job! Very nice read! Best! Great post! I really enjoy reading your stuff. I don’t understand why ACM don’t expand youth camps further into north america, particularly, the USA. I wonder if the admission fees for the kids to enter the camps makes them self sustaining? If so, I think it would be only a matter of time that these expand as they not just find talent but build fan base as well!